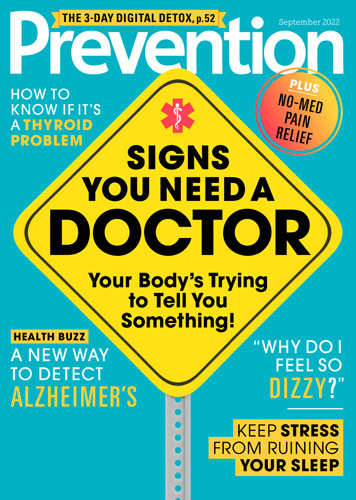 Fill in the form below to give a 1-year gift subscription to Prevention for just $24! *Non-US subscribers will be charged an additional US$12 (Canada) and US$28 (Int'l) for Prevention shipping. All rates are in US dollars. I would also like one year for myself for $24! *Continuous Service Program: I understand that unless I tell you otherwise, I will receive uninterrupted service of my gift and other subscription(s). My gift and other subscription(s) will be automatically renewed at the end of each subscription term at the rate then in effect. I authorize you to fulfill my subscription(s) and charge the credit/debit card if provided, or send me a bill if not. I won't be bothered with any renewal notices, instead, I will receive a clearly marked reminder notice with the then current rate(s) about 30 days prior to charging my credit/debit card or receiving a bill. I may opt out of the automatic renewal at any time by contacting customer service and receive a refund for all unmailed issues of my gift and other subscription(s). published by Hearst Magazine Media, Inc. © 2019. Sales tax will be charged where applicable. All rates are in US dollars.